Product prices and availability are accurate as of 2019-04-15 07:32:41 UTC and are subject to change. Any price and availability information displayed on http://www.amazon.com/ at the time of purchase will apply to the purchase of this product. They called themselves “The Foolish Club,” the eight original franchise owners in the fledgling American Football League, and the biggest fool of them all, one could argue, was Ralph Wilson. While other owners set up shop in major cities such as New York, Los Angeles, Boston, Dallas and Houston, Wilson - a Detroit businessman who owned a small share of the NFL Lions and whose true ambition was to own his own professional football team - chose Buffalo as his home base and heard the snickers from coast to coast. Who’s laughing now? More than 45 years later this mid-sized industrial city on the cold shores of Lake Erie plays host to one of the NFL’s most vibrant franchises. Since their inception in 1960 the Bills have been Buffalo's showcase team and through the decades they have taken their loyal fans on the ride of a lifetime in building a storied history replete with so much excitement and fulfillment, yet so much heartbreak and frustration. From the humble beginnings of the AFL, to the back-to-back AFL championships in 1964 and 1965, to the merger with the NFL which vaulted Buffalo into the big time, to the record-breaking success of O.J. Simpson, to the playoff excitement of the early 1980s, to the unprecedented feat of appearing in four straight Super Bowls in the 1990s, and all the down times in between, the Bills have commanded Buffalo’s undivided attention. In Sal Maiorana’s Game of My Life, former and current players and coaches will re-kindle memories of the greatest games and performances in franchise history, events that have shaped Buffalo fandom and defined the parameters of bar room rants for generations to come. What game stands above all the others? Perhaps the 1964 AFL Championship Game at War Memorial Stadium, a 20-7 Buffalo victory over the supremely talented San Diego Chargers that was highlighted by Mike Stratton's tackle heard 'round the world. There was the 1973 season finale when Simpson became the first running back in NFL history to surpass 2,000 yards rushing. How about the glorious season-opener in 1980 when the Bills ended their NFL-record 20-game losing streak to hated rival Miami. Is there any doubt that the most dominating performance was the 1990 AFC Championship Game when the no-huddling Bills embarrassed the proud Raiders, 51-3, to earn their first Super Bowl berth. And will anyone ever forget where they were the January 1993 afternoon when the Bills pulled off the greatest comeback in NFL history, rallying from down 35-3 to defeat the Houston Oilers 41-38 in a wild-card playoff game? 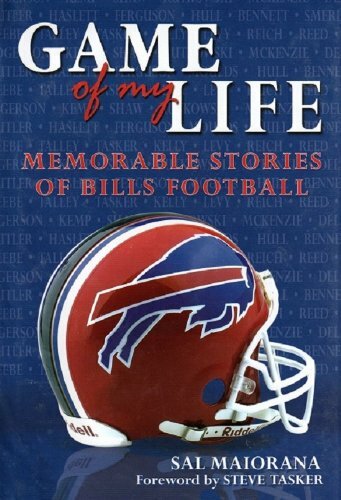 Game of My Life is a celebration of Bills football, and these pages will accentuate the glory of their victories, reveal the heartbreak of their defeats, spotlight the men who have proudly worn the Buffalo on their helmets, and stir the emotions and passions of a fan base that has supported this franchise through good times and bad.